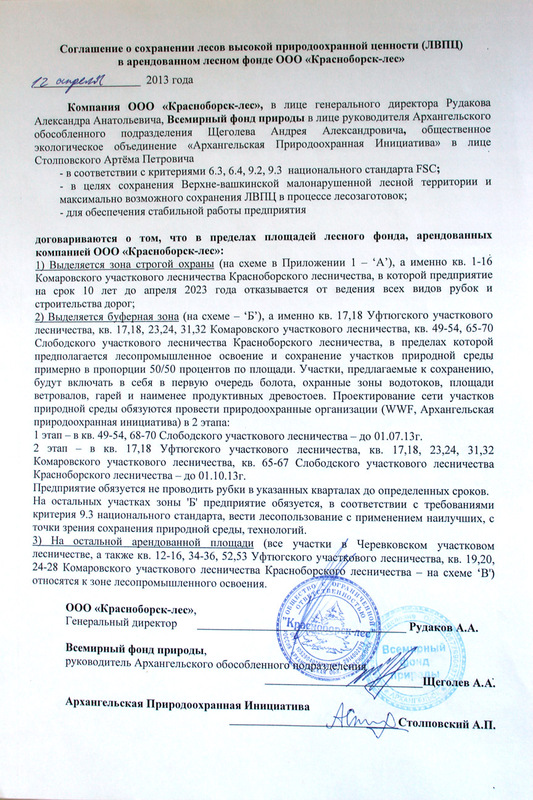 Conservation agreement of HCVF in the leased forest area of ООО "Ustyanskaya LPK"
Conservation agreement of HCVF with social and economical values for local people in the leased forest area of ООО "Dmitrievsky LPH"
Conservation agreement of Intact Forest Landscape n the area between rivers the Northern Dvina and Pinega, in the leased forest area of ООО "Vaengsky LPH"
Conservation agreement of Intact Forest Landscape n the area between rivers the Northern Dvina and Pinega, in the leased forest area of ООО "Dvinlesprom"
Conservation agreement of HCVF with social and economical values for local people in the leased forest area of ООО "Pinezhjeles"
Conservation agreement of Intact Foret Lanscapes, which are HCVF type II in the leased forest area of JSC "Ilim Group"
Conservation agreement of HCVF with social and economical values for local people in the leased forest area of ООО "Nord-Les"
Conservation agreement of Intact Forest Landscape in the leased forest area of JSC "Pomorskaja sawmill company" and LLC "Solombaljskaja timber company"
Conservation agreement of HCVF in the leased forest area of ООО "KarpogoryLes"
Valid until: partly till the end of the leasing period, partly till 04.2018, partly till 04.2020. Forest sub-district Verkolskoe, Forest district Karpogorskoe. 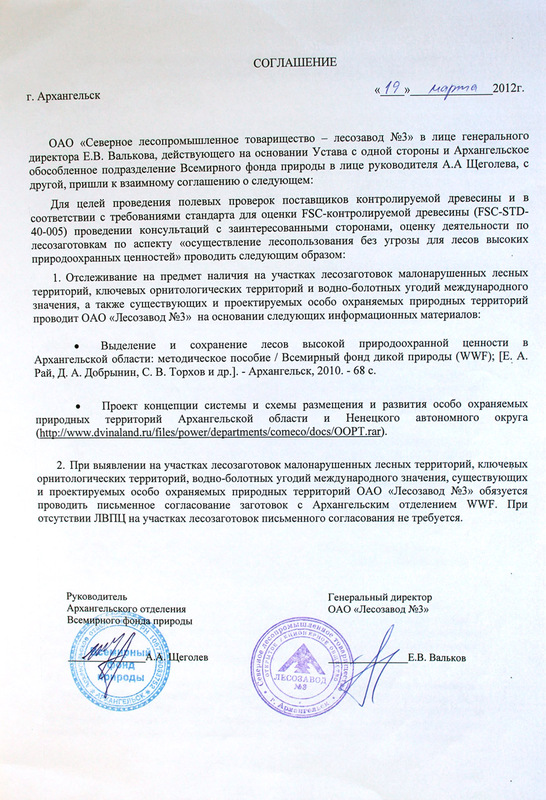 Stolpovsky Artem Petrovich, ”Arkhangelsk nature conservation initiative”. Valid until: partly till 04.2018, partly till 04.2023. 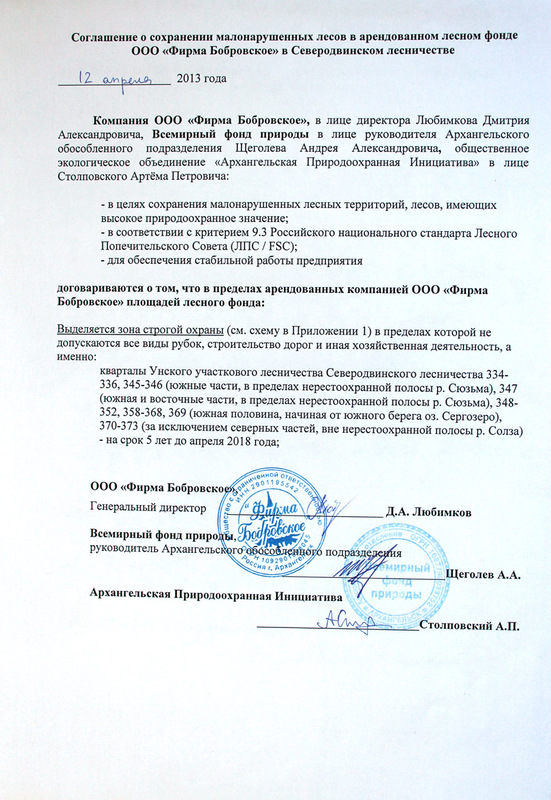 Conservation agreement of High Conservation Value Forests (HCVF) in the leased forest area of ООО "Yumizh-Les"
Conservation agreement of High Conservation Value Forests (HCVF) in the leased forest area of ООО "Krasnoborsk-Les"
Forest sub-district Unskoe, Forest district Severodvinskoe. 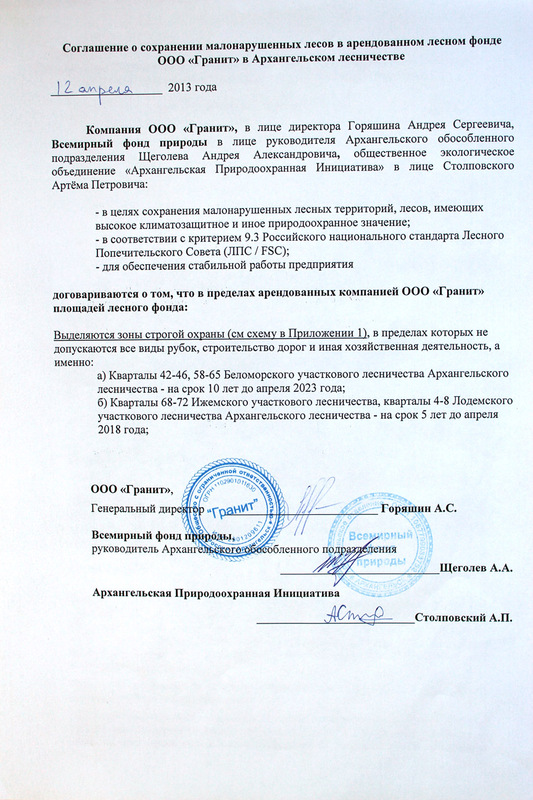 Popov Fedor Vasilievich, Acting Chief of FKU OIU OUHD-1 UFSIN of Russian Federation in Arkhangels region. 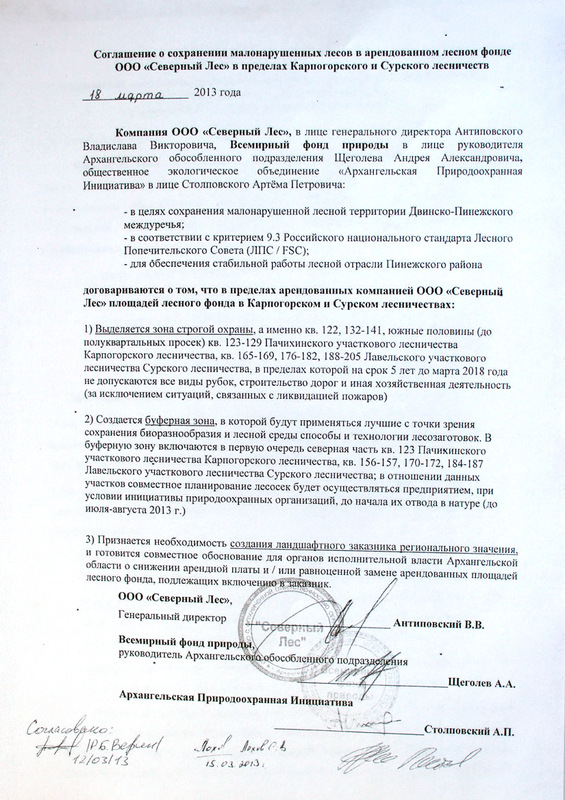 Nifantiev Evgeny Leonidovich, General Director of ООО " KarpogoryLes”. Valid until: partly till the end of the leasing period, partly till 03.2018. Forest sub-district Lavelskoe, Forest district Surskoe. Status: partly valid in the zone of strict protection in Verhnevaengskoe forestry. 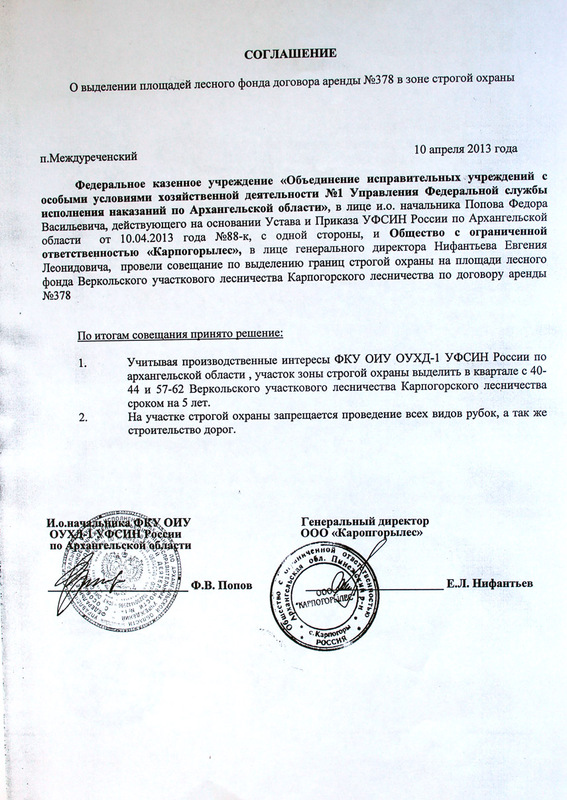 In other areas is not valid due to forest leasing termination or ending the term of agreement. Forest sub-district Nizhnetoemskoe, Forest district Verhnetoemskoe. Aksenov Dmitry Evgenjevich, Director of non-profit partnership “Transparent world”. Status: invalid. HCVF have already not been leased by this company. Forest sub-district Suletskoe, Forest district Surskoe. 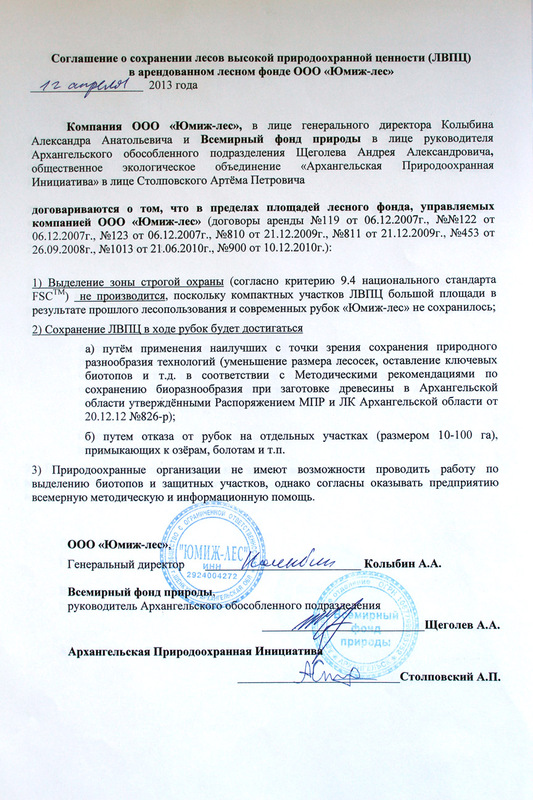 Shegolev Andrey Alexandrovich, the Head of WWF Russia Archangelsk Office. Yaroshenko A. Y., Greenpeace Russia Forest campaign coordinator. Forest district Verhnevaengskoe, Bereznikovsky Leshoz. Yaroshenko Alexey Yurjevich, Greenpeace Russia Forest campaign coordinator. Forest district Yugnovskoe, Bereznikovsky Leshoz. Ptichnikov Andrey Vladimirovich,WWF Russia Forest programme coordinator.